Occasionally I go to a dance show in which everything fits– the essence of the performance space, the energy of the dancers, and the vision of the choreographer. Everything seems to jive in such a way that allows me, as an audience member, to enter an alternate universe for just a fleeting moment. The bicoastal, BARE Dance Company provided such a performance this weekend at Diavolo Dance Theater. Choreographed by company founder and director Mike Esperanza, VENOMOUS is an evening length work that takes the audience on a journey through a vivid world of movement, color, passion, and struggle for power. The New York based half of the company was in town to celebrate BARE’s 10 year anniversary and participate in Celebrate Dance among other things during their visit. I was pleased to catch their final performance on Sunday night. 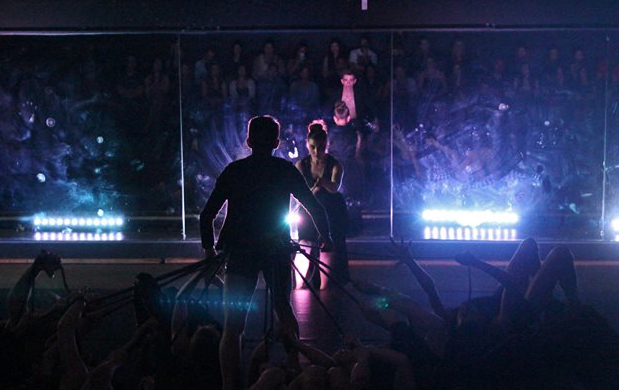 The evening began with a preshow in which company members performed what seemed like a structured improvisation using gesture, contact improvisation, and site specific interaction with the exposed mirror behind them. The movement palette included spatially slippery movements with an amoebic flow that contrasted with the direct focus of the dancers, outward toward each other and the audience. The tone was both ominous and appealing, provoking the audience to engage with this alternate world of cunning and duplicity. Meanwhile, featured performer Katrina Muffley silently escorted the audience members to their seats, patiently, almost timelessly. She scanned the space with hollow eyes and a collapsed chest, attending to the needs of the audience members without being rushed or shaken by the frazzled energy of the entering audience members. The piece began with a duet by Muffley and another featured dancer, Paul Vickers. To call it a duet is a bit misleading as Muffley did the dancing while Vickers sat on a chair, connected to Muffley only by a black rope around his neck. Muffley pulled and reached through the space with desperation, dropping repeatedly to the floor with an unyielding sense of urgency and distress. While the relationship between these two dancers was never made explicit, I interpreted that they were close, perhaps familial, such as a mother and son. Vickers’ clean cut Midwestern look set him apart from the gritty urban appearance of the other men in the cast, making him look fresh, naïve, and vulnerable. The nature of the female figure was a bit less clear. Sometimes her intention seemed caring, and other times oppressive. Was she there to help him or trap him? The provocative nature of this relationship became the focal point for me, as I witnessed Vickers’ journey through a world of dispassionate evil. The majority of the piece can be described as a series of ensemble sections with women separate, men separate, and a mix of both. Vickers interacted first in a powerless way, entering on wobbly legs as a newborn foal. The cast worked as a whole, an amoebic being with a desire to surround and consume its prey. Vickers was soon surrounded and bitten by this venomous creature. Prodded in the belly with a hand like the forked tongue of a snake, the innocence eventually faded away from Vickers and was replaced with a menacing power that turned on the other dancers. 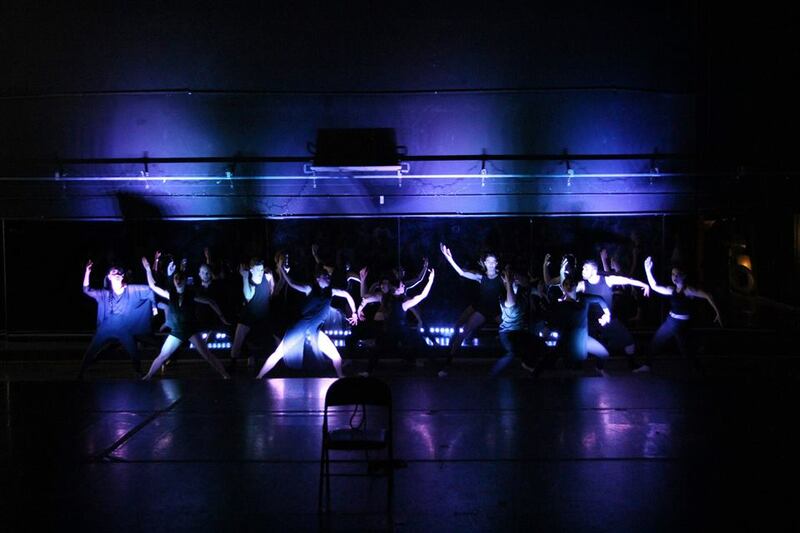 The cast performed beautiful contact based duets, with a sense of effortless ease and dynamic power. The dancers possessed exquisite contemporary technique and partnering skills. This cast should be lauded for its incredible strength and predatory potency. The final section of the work included Vickers wearing a harness around his hips to which the other cast members clipped their ropes, surrounding him like spokes of a wheel. The visual was viscerally captivating as Vickers threw his body weight around the circle, suspended by the attached ropes. It struck me as a poetic image in the way that the other dancers were able to support him with their ropes, but only by maintaining tension in the ropes by pulling away from him. The obscurity of the metaphor left much to the imagination and rich interpretation. The weaknesses of the work only existed in a handful of moments (often transitional moments) in which the power struggle seemed momentarily and inexplicable reversed. 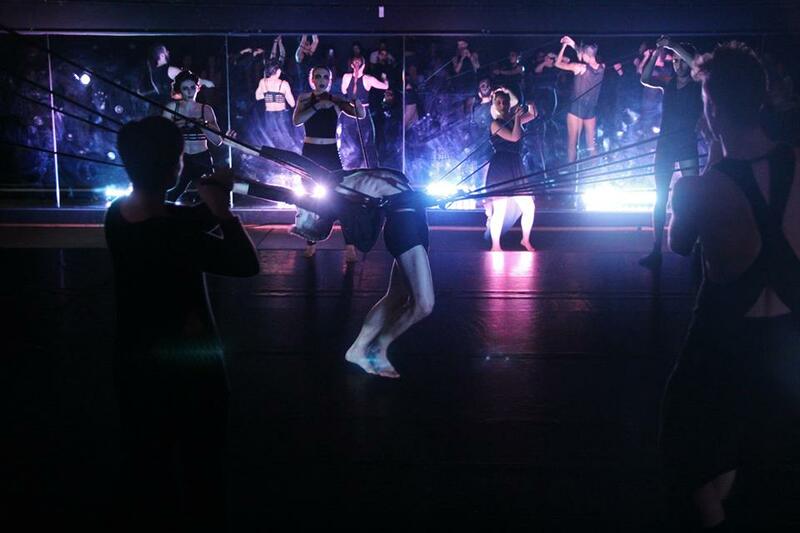 But, as a whole, the piece worked for its unique gestural and rhythmic movement invention, the seamless partnering, the thematically integrated nature of the soundtrack (also composed by Mike Esperanza), the eerie and appropriately disconcerting neon lighting design by Jason Kuzia, and the skill of the performers to physically and mentally inhabit this gritty world. BARE Dance Company reflects an aesthetic that is current, edgy, and provocative, while also being timeless, well crafted and thoroughly satisfying. Mike Esperanza is an artist with a complete vision as well as the skill set and company to bring it to life. A treat for the Los Angeles dance audiences. Bravo!